Did you know that April is National Car Care Month? Bring your Toyota in for auto service in Rochester, New Hampshire this Spring. Usually around this time of year most folks are busy planning spring break vacations or preparing for the income tax deadline and not thinking much about their vehicles. However, spring is the perfect time to ready your ride for upcoming road trips and the extreme heat of summer. AAA Roadside Service estimates that more than 9 million motorists are stranded during the summer months and most of these breakdowns could be avoided with proper car maintenance. 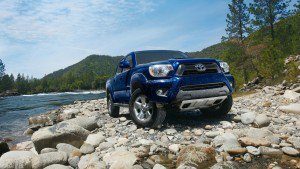 The following are a few basic maintenance procedures that will get your Toyota car or truck in tip top shape for the Spring/Summer driving season. Check Fluids – Engine oil, power steering, brake and transmission fluids as well as antifreeze, coolant and windshield washer solvents should be checked and filled to recommended levels. Tire Inspection – If bald spots, bulges or severely worn tread is apparent new tires are in order. Uneven tread wear can also indicate a need for wheel alignment. Tire pressure should match the factory guidelines for the best performance and to increase gas mileage. Hose and Belt Inspection/Replacement – Any hoses and belts that are cracked, brittle, frayed or loose should be replaced. Battery Inspection/Replacement – Depending on the age of your battery and the weather conditions you drive in it could be time to replace your battery. A certified technician can test the strength of your battery and if necessary replace it. Exhaust System Analysis – Damaged or broken supports and hangers can result in exhaust leaks that can be very dangerous. If damage is found it should be repaired immediately. Get a Tune-up – A complete tune-up will help your engine deliver the best fuel economy, reduce emissions and distribute the best balance of power. Check Air Conditioning, Heating & Ventilation – No one wants to sit in a car with broken air conditioning in 100 degree weather and a functioning heater will be appreciated on late night or early morning drives. Air and heating system inspection and/or repair will ensure a comfortable driving experience. Suspension & Steering Inspection – Shock absorbers, struts and chassis parts should be inspected annually to provide a smooth ride and reduce the likelihood of expensive repairs in the future. Check Windshield wipers & Lighting – Although the rainy season is coming to an end, it is still important to have efficient wiper blades in place for use on foggy or damp mornings. All exterior and interior lights should also be checked so that you can see clearly and clearly be seen. For expert Auto Service in Rochester, New Hampshire and all of the maintenance services needed for a proper spring check-up come to Rochester Toyota. We are currently running a variety of auto service and maintenance specials for oil changes, brake inspections and more. See our current Toyota Service Special Offers and coupons then Schedule auto service quickly and easily online.